Mel Wells is a bestselling author, TEDx speaker, and health and eating psychology coach. She helps women transform their relationship with food and themselves, to become the best version of themselves possible. 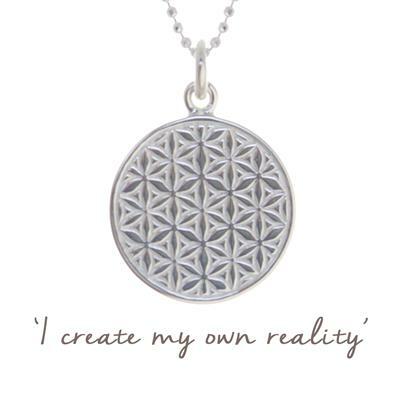 Her necklace for Mantra uses the 'Flower of Life' design, an ancient pattern that symbolises the connections that draw us all together. The symmetrical pattern represents the unfolding creation of the universe, and is a good metaphor for the power of creation. Mel has chosen the mantra, 'I create my own reality', to go with this design, as a message to empower women to feel more in control of their lives.